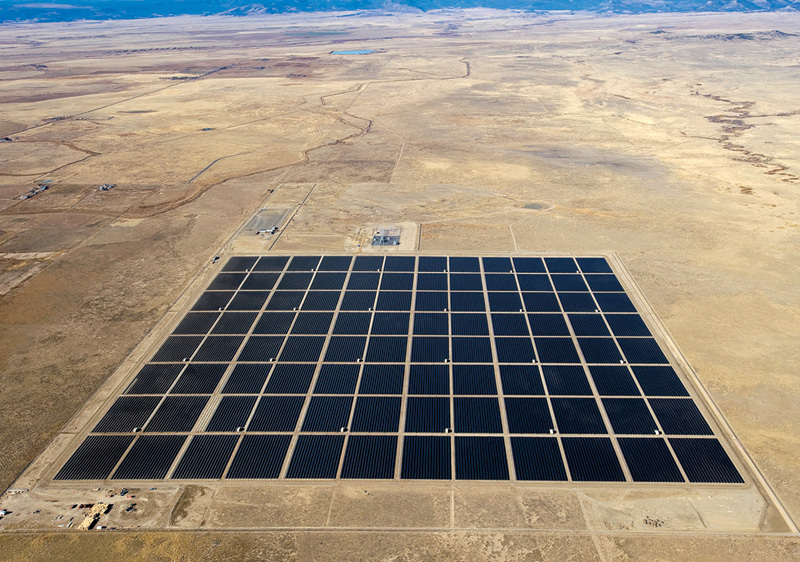 Former media mogul Ted Turner and the Southern Company have taken a big stake in solar power, with the recently completed 30 MW Cimarron project in New Mexico. It wasbuilt by First Solar and includes close to half-a-million of the company's solar panels. The Cimarron project has close to half-a-million First Solar solar panels—490,000 to be exact—on a 364-acre site in northeastern New Mexico, on some of the best land for solar power in the southwestern U.S.
By just about any standard in renewable energy in the U.S., the Cimarron solar project in northeastern New Mexico is huge. The Cimarron project, completed late last year, has close to half-a-million solar panels—490,000 to be exact—on a 364-acre site on some of the best land for solar power in the southwestern U.S.
At 30 MW, it is easily one of the largest solar power plants in the U.S., and to add to the interest in the project, it is co-owned by one of the highest profile advocates of renewable energy in the country—former media mogul Ted Turner. "We're very excited to see this project completed and producing clean solar energy to power homes and businesses in New Mexico," said Turner, when the project started commercial operations in January. "Large-scale solar generation is among the fastest growing energy sources in the world, and we're pleased that we can be a part of that growth." Cimarron is the first project in a partnership between major utility Southern Company of Atlanta and Turner, and it will supply power under a 25-year Power Purchase Agreement to the member electric cooperatives of Tri-State Generation and Transmission Association. Tri-State generates and transmits electricity to its member systems throughout a 200,000 square-mile service territory across Colorado, Nebraska, Wyoming, and New Mexico, where the power from Cimarron helps meet Renewable Portfolio Standards. The project is a milestone for Southern Company as it steadily incorporates more renewables into its energy portfolio, said Tom Fanning, company chairman, president, and CEO. Fanning also noted that New Mexico, with its abundant solar resources, was an ideal location to establish the company's first commercial-scale solar operation. The plant site is located within the service territory of Tri-State member system Springer Electric Cooperative in Colfax County, N.M., and is adjacent to Turner's Vermejo Park Ranch. Southern Company and Turner Renewable Energy acquired the project from First Solar Inc. in March 2010. Turner Renewable Energy is a wholly owned subsidiary of Turner Enterprises and has a focus on the development of commercial-scale solar projects. Arizona-based First Solar, a major player in both solar module manufacturing and solar project development, developed and constructed the facility and will provide operation and maintenance services under a long-term contract. Justin Bloch, First Solar's project manager on Cimarron, explained that the company's involvement with the project dates back to 2007, when First Solar made an acquisition of Turner Renewable Energy to obtain engineering, procurement, and construction (EPC) capabilities of utility scale solar plants in the U.S. 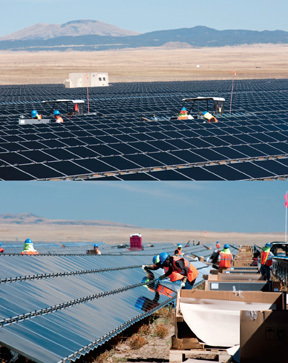 Initially expected to go on line by the end of 2010, the 30 MW Cimarron solar project was completed in eight months and began commercial operation in early December, nearly a month ahead of schedule. "Our development team had been working on the project for about two years prior to the start of construction," Bloch explained. The Cimarron site offers a number of attractive features, said Bloch. "It receives a good number of sun days a year, and the temperature is relatively stable in this area. The site is located almost directly under a 115 kV transmission line that is owned by Tri-State." The site actually used to be part of the adjacent 920 square mile Vermejo Park Ranch owned by Ted Turner. While Cimarron is very large, with its 490,000 solar panels, Bloch says tackling such a big project successfully comes down to having a system and executing that system. "Earlier on, we built a 10 MW project for Sempra Generation in Nevada, and it was a matter of scaling things up to 30 MW for the Cimarron project." They are moving to additional big solar projects. "We have built projects of 48 MW and 80 MW in different parts of the U.S. and Canada. And we have an even larger project in development, the Topaz project in California, which is 550 MW." Essentially, they have developed a construction model, and they multiply that model a number of times, depending on the size of the project. "For Cimarron, it was one megawatt times 30—at First Solar, we've developed a scalable model and adjust it accordingly." Initially expected to go on line by the end of 2010, the facility was completed in eight months and began commercial operation in early December, nearly a month ahead of schedule. How were they able to finish the project earlier? "I go back to scalability," says Bloch. "It's working to perfect it on a small scale and then scaling it up to a much larger scale, and that enables us to move faster on projects. We built Cimarron at the velocity and speed to come in early. We perfected what we do before we started the Cimarron project. "Cimarron is kind of a training ground for future, projects, too," he added. "The speed at which we built it is faster than the speed at which we built the 10 MW Nevada project. And we will be faster on the Topaz project. Constantly applying lessons learned from past projects to future projects is essential to our success." Those lessons, of course, are part of what gives First Solar an edge on the construction side. But Bloch said the company also benefits from it being a turnkey supplier and its Engineering Procurement Construction (EPC) side. "We're a vertically integrated company in that we own the module manufacturing process, perform EPC activities, and operate and maintain our plants." And throughout, as Bloch noted, they tweak the process to deliver further efficiencies. On the construction side, for example, any improvements they make on the construction/assembly process can have a huge impact on the time it takes to complete a project. "At Cimarron, for example, we had close to half-a million modules. If you are able to make small improvements every time you install a module, even seconds, you can easily run the math and see the savings. You could be saving days, especially when you talk about scaling things up for an even larger project, such as the 550 MW Topaz project." Before that, on the manufacturing side, First Solar has plenty of resources. It is one of the world's leading PV module manufacturers, with current production capacity of 1.4 GW of modules per year. It has over 3 GW of working solar installations world-wide. The company manufactures only one product: thin film PV solar modules, roughly two feet by four feet. In 2010, First Solar unveiled its FS Series 3 PV module, the latest extension of its module design. The Series 3 incorporates a number of improvements including a redesigned electrical layout that allows higher efficiencies, lower module voltages to accommodate 50 percent more modules per string, and a new locking connector with tactile feedback for connection productivity. The FS Series 3 PV modules used on the Cimarron project were placed on structural steel mounting, featuring a fixed tilt system, facing south. One of First Solar's major advantages is its vertical integration and the turnkey approach it brings to solar projects, says Bloch. "We manufacture the solar modules, we ship the modules to the site, we buy all the materials through our supply chain group, our EPC group will design the system and build it, and in most cases, we then turn it over to our operations and maintenance group, who will run the plant through its guaranteed 25-year life cycle. "This is the advantage we provide to our customers, being able to do a one-stop shop with First Solar—if they want to build a solar power plant, we can handle all aspects of that from beginning to end." Speaking of the end, First Solar even has a fully pre-paid recycling and collection program in place for their modules and system, once they have completed their life span. The Cimarron project site is located within the service territory of Tri-State Generation and Transmission Association member system Springer Electric Cooperative—and is adjacent to Ted Turner's Vermejo Park Ranch. There is a 25-year Power Purchase Agreement in place to supply the member electric cooperatives of Tri-State. Every time a solar module goes out the door of First Solar, they put money aside to pay for its end of life collection and recycling. For example, there are close to half a million solar modules in northern New Mexico with the Cimarron project, and the plan is for none of them to be there at the end of their economic life—they will all be recycled. With their recycling program, they are currently able to capture 90 percent of the glass and semiconductor content. "This is important to us because we are big believers in sustainability," says Bloch. "The reason we are in business is to provide a sustainable, affordable source of energy, and leaving panels around at the end of their life is not sustainable." Any project the size of Cimarron brings its own challenges; the largest challenge, Bloch says, was sourcing local labor. "You can imagine coming into a remote area of a western state, especially in New Mexico where the cities are spread out, and trying to get well over 200 qualified people to work on a project. The nearest large center to the project site was 100 miles away." This required extra effort and took a bit of time, but they were able to find the people they needed. Then there was the challenge of dealing with materials on a large project. But going back to First Solar being integrated, it has its own internal supply chain team who moved materials to the site as needed, pretty much on a just-in-time basis. With its low yearly precipitation, and of course, sunny climate, poor weather was not a factor in construction of the project. "Northern New Mexico has so many sunshine days, it really does not pose a problem," says Bloch. "And we didn't work through the harsh winter months. But even if we had, it would have been fine." The company's ground mounting systems are designed to be used in all types of soil conditions. The soil conditions in northern New Mexico are sandy clay soils, so it didn't pose any problem. Long before a shovel hits the dirt, though, First Solar's development team carries out a full environmental assessment for each site. "Southern Company and Ted Turner—the owners—are keenly focused on ensuring that the project meets all environmental standards and has as little impact as possible on the land," said Bloch. "Given their focus and ours, it's certain that this renewable facility was built with every aspect of environmental responsibility in mind." The Cimarron site did not have any environmental restrictions. "There really wasn't anything on the environmental side, unless you count some of the bison that wandered over from the Turner ranch, but they were well outside the solar plant," Bloch joked. Bloch has plenty of construction project management experience, both at First Solar, and from previously working in the homebuilding industry. He says one of the keys to successfully completing a project such as Cimarron is very basic: having good people, working together. "I give a lot of credit to the First Solar team," he says. "We've gathered together people from multiple industries, whether it is the power industry, the home building market, commercial building—folks have come together here so we essentially have a group of experts building solar plants. "It's the engineering team that puts together the design, the supply chain team that procures all the materials, and the construction team that goes out and executes a project, along with our operation and maintenance teams who are experts at running power plants." Those teams will all be put to the test with one of the company's next major projects, the 550 MW Topaz project in California. "It will be on an order of magnitude much larger than Cimarron, but basically it's taking the 30 MW model and scaling it up to 550 MW. What we were doing at Cimarron for six months, we'll be doing at Topaz for three years." 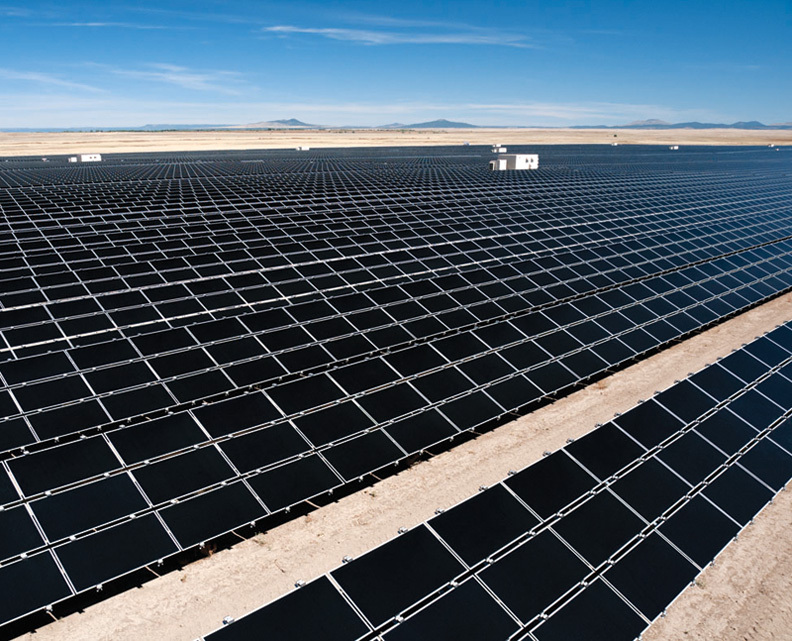 Even though large projects such as Topaz are moving ahead, the solar power industry as a whole is advocating a federal renewable energy standard, to help maintain the industry's momentum. First Solar has been a beneficiary of the Renewable Portfolio Standards that have been in place at the state level, notably the California standard which required utilities to achieve 20 percent renewables by 2010 and 30 percent by 2020. For example, the company's 290 MW Agua Caliente project in Arizona will be providing renewable power to California. The industry as a whole has also benefited from a number of federal programs that support the development of solar power. There is the Treasury grant program that helps to finance solar projects, and the Department of Energy's Loan Guarantee Program that has helped the industry through a period of tight capital and debt markets that aren't used to financing large scale solar projects. "This isn't direct market assistance in the form of a national RPS, but these programs are still very valuable," says Bloch.